You may download the scripts for free, but use them at your own risk. Please save your Finale document before using the plugins! Most of the scripts were only tested very shortly and JW Lua is also still in beta state. Should you notice any problems, please tell us and we will try to fix the bugs if possible. 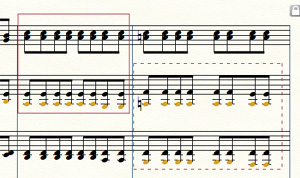 Converts two tied double whole notes within a measure to a longa note and four tied double whole notes to a maxima note. Make sure the whole notes are in the same measure (and not tied over the barline). It uses the longa/maxima noteheads from the free Fughetta font as default and the rest symbols from Bravura. But it's possible to change the symbol and font. Simply adjust: FontName, FontSize, CustomChar and RestDisplacement in the first lines of the script. so internally they will have the length of longa notes (=16384). This might effect the music spacing and/or playback. Mensural notation with the November2 "Renaissance" template and the Make Longa plugin. Fixes the bug that the augmentation dot on dotted 8th notes in Jazz font appears too far to the right. Changes all noteheads in a selected region to a new font, size and/or symbol. Affects all or one layer, all durations or one. This plugin halves the time signature (e.g. 4/2 to 2/2; or 5/4 to 3/4 and 2/4) and maintains the barline and key signature settings. Video "Time Signature Split": How to set it up for splitting for example 13/8 to 6/8 and 7/8. Video "Time Signature Split": Both default and real whole rests are supported. Automatically adds fingerings for brass instruments (trumpet, trombone, etc.). ...and hide all other occurences. Reduces the measure width in a measure that only contains one long note (e.g. in the final bar). Merges the two multi-measure rest numbers on two staff groups to a single number. Make sure to remove the line 'finaleplugin.MaxFinaleVersion = "2014"' before running the script on Fin25 - otherwise it won't work. It can replace fix text inserts like title, arranger or accidental with a new text string. Attention: the original insert strings are removed. So if you want to change for example the title string later, you must call the plugin again. Otherwise it won't update. Example: To add an accidental to a title you replace "^title()" with "Title Text in C^sharp()". If you want to change it again, replace e.g. "Title Text in C^sharp()" with "Title Text2 in F^flat()". The list of Finale's internal tag names can be found here. Many JW Lua scripts written by Chris can be found here (in French!). Nick Mazuk's scripts on his website. Jari Williamsson, the developer of JW Lua, also offers a few scripts on his website. All scripts require a recent installation of Jari Williamsson's JW Lua plugin for Finale from http://finaletips.nu.